My favorite part of football season? The food, of course! I mean, as much as I love to watch our beloved Buffalo Bills, more often than not, they’re losing. But at least I’ve got some delicious, real food tailgating snacks to soften the blow! 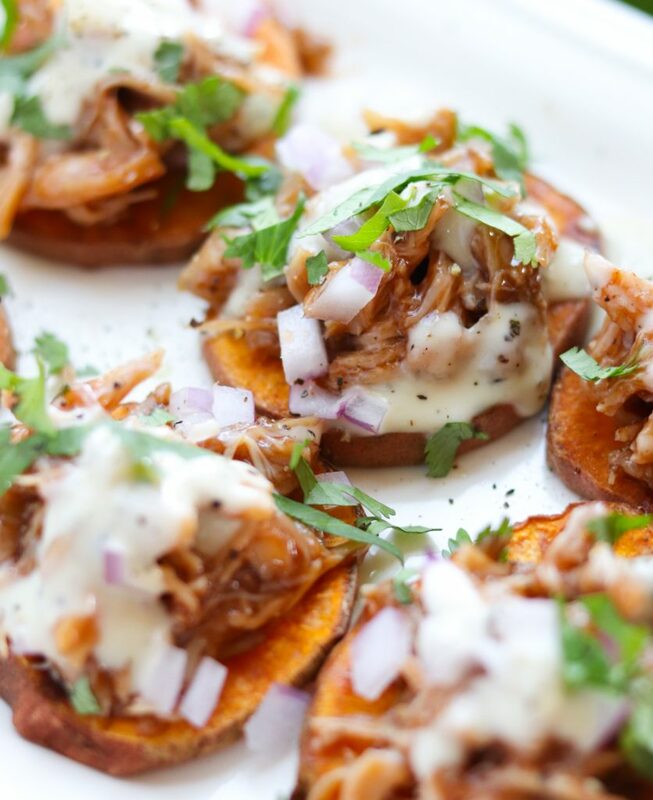 And these Whole30 compliant BBQ Chicken & Ranch Sliders are definitely making our Sunday afternoons a lot better! This is absolutely one of the simplest recipes I’ve ever made — The chicken is made in the slow cooker, so it’s almost totally hands-off (plus completely fall apart tender once it’s ready). And then the sweet potato rounds are roasted in the oven until they’re crispy. Pretty much all you need to do then is assemble the sliders – Top each round with the bbq chicken, red onion, herbs, and compliant ranch dressing. What could be easier than that? 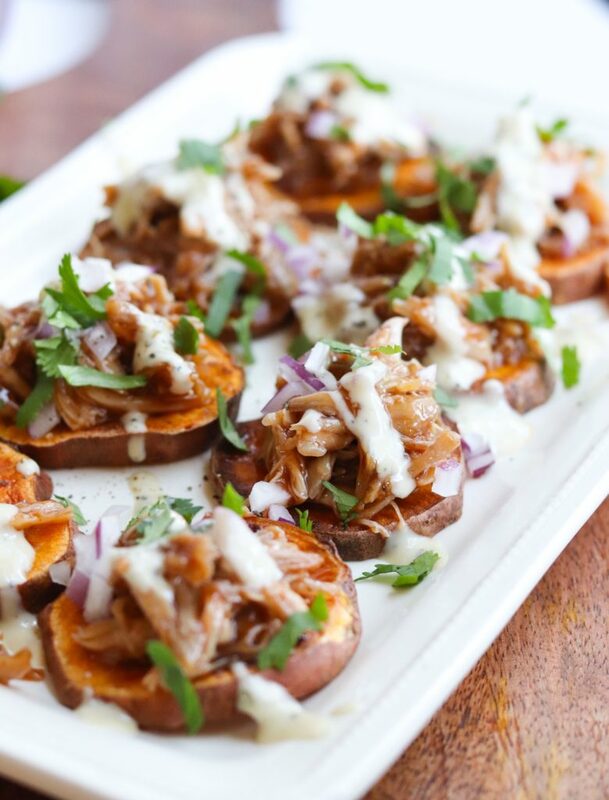 Delicious Whole30 compliant roasted sweet potato rounds topped with bbq chicken, red onion, ranch, and cilantro. A really simple, crowd-pleasing Paleo appetizer! Lightly season the chicken with salt and pepper and add to the crockpot with half of the BBQ sauce. Wash potatoes and slice in 1/4 inch rounds. Toss with olive oil, season lightly with salt & pepper, and lay on a lined parchment sheet. Bake for about 12-14 minutes, turning once halfway through, and watching closely near the end. Just before serving, remove the chicken with a slotted spoon and mix with the remaining BBQ sauce. 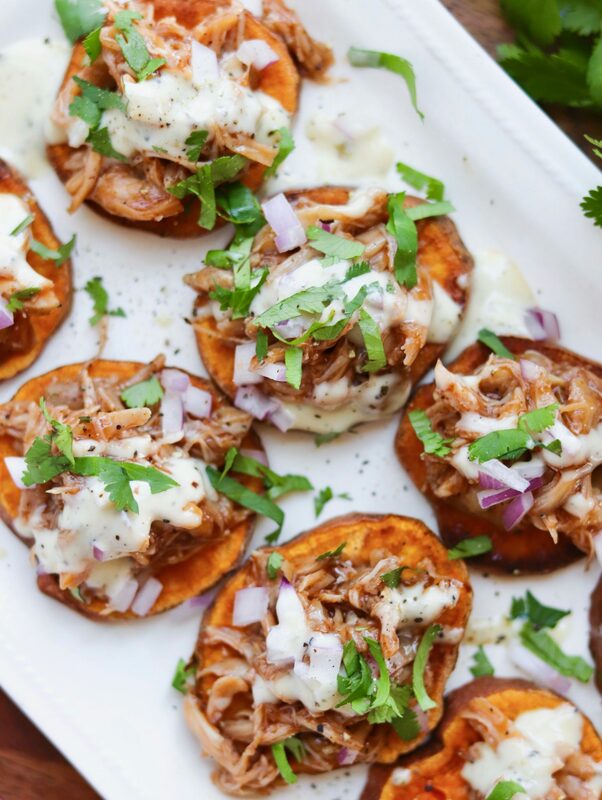 Top each slice of sweet potato with about a tablespoon of chicken, a drizzle of ranch, some diced red onion, and cilantro. 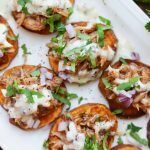 If you enjoy this recipe for Whole30 BBQ Chicken & Ranch Sliders, check out my recipe for Whole30 Barbacoa Bowls. Please comment below & share to your favorite social channels!